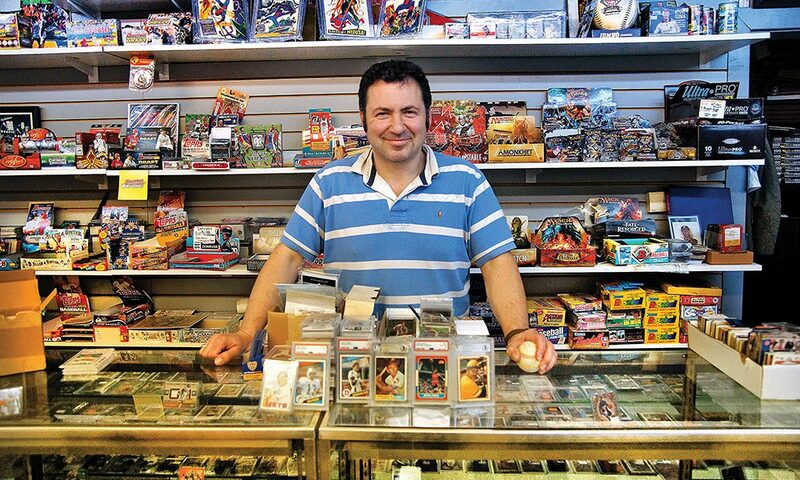 Newly-minted citizen, Alex Itskov, owns the area's coolest card store. Period. A brief confession: At the age of 13, when my parents suggested I squirrel away my bar mitzvah money, saving it for my soon-to-be-bright future, I instead blew most of it on baseball cards. (My go-to spot at the time is still there on Caroline Street: The Vault.) I’ve been an avid collector my entire life, and have spent thousands of dollars on my collection, which includes everything from David “Big Papi” Ortiz’s rookie card (I pulled it out of a pack in 1997) and a 1933 Goudey No. 1 Benny Bengough (an expensive rarity) to full sets of Topps cards and a ball signed by Hall of Fame pitcher John Smoltz. It just so happens that the Capital Region is one of those rare places in the US where sports card stores are seemingly still everywhere and doing a bustling business: I know of shops in North Greenbush (The Collector’s Friend), Albany (Finnegan’s Sports Cards), Cohoes (The Locker Room 78), Watervliet (Matt’s Baseball) and Saratoga Springs (the aforementioned Vault). But my favorite spot of the all is Al’s House of Sports Cards in Schenectady. I like that it’s in the Electric City; my maternal grandparents, Van and Martha Ladd, who are long gone now, lived in Schenectady their entire lives—and I grew up going to their house on Avon Road. (Ironically, it’s just a five-minute drive from Al’s, and when I drove out to interview him this past winter, I arrived 30 minutes early and had some time to kill, so I drove over to Avon to scope out my grandparents’ old digs. I parked illegally on the side of the road, and while snapping a shot on my Instagram of the palatial house, a man came out the front door and confronted me at my car. “Do you know why I’m coming out here?” he asked me. I told him that I was here because this had been my grandparents’ house when I was growing up and I was paying homage to it on my social account. Then, he asked me if I wanted a tour. I obliged. I ended up spending that half hour touring a house I knew inside and out as a child. I left there for Al’s with a new glow in my heart.) In regards to Al’s, it’s also an aesthetics thing for me: The inside of the store has mountains and caverns of cards piled high, hither and yon, in no apparent order. 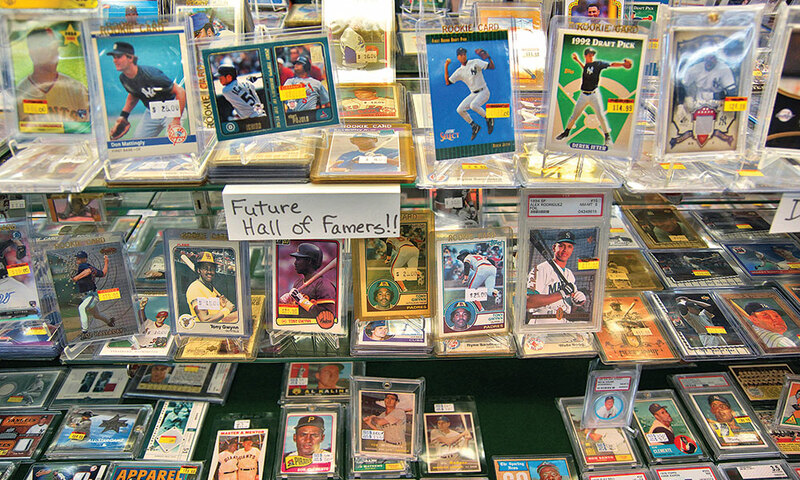 There are open boxes and sets, cards in top-loaders (those little hard-plastic cases) and sleeves (the soft cases) jammed into crates and in stacks on a display case, as well as comic books, hardcovers, autographs and a range of other sports memorabilia. It’s delightfully all-over-the-place, and to me, that’s heaven on Earth. The “Al” behind the store’s name is Alex Itskov, who immigrated to Upstate New York from Russia in the 1980s with his family. He grew up in the projects on food stamps, but persevered, graduating from Albany High School and eventually finding success in the world of business. He also got swept up in the sports card world—“the hobby,” as it’s lovingly known to collectors like me—which was peaking at the time of his arrival. “I just loved it; I was always a collector,” he says. He tells me that it’s the history that makes it most interesting for him; when he’s holding a card from the ’50s or ’60s, he’s touching something that has a historical value to it. Even though the hobby’s been in steep decline for decades—the bottom fell out in the mid-’90s—Itskov still sees a steady stream of customers come into his store. Kids are all about Yankees’ phenom Aaron Judge and Pokémon, a Nintendo-owned trading-card game, while adults have been buying up the Dungeons & Dragons-y Magic: The Gathering and cheap singles to complete sets (“singles” are how us collectors refer to single player cards; it has nothing to do with Tinder). Schenectady often gets a bad rap for being a little rough around the edges, but Itskov loves his adopted city. “Schenectady’s just a cool little town; it’s just different,” he says. I can’t help but agree. I have a history there—not to mention a “supplier” for life. A shorter version of this story ran in the 20th Anniversary issue of saratoga living.